Sundays, I don’t know what day of choice it may be for other members but Sundays have become my day for delving into the sock drawer for the Buick keys. Sunday the 19th June was no different other than being made extra-special this time in expectation of attending my first club event. Glancing out the bedroom window early that morning to check the weather I noted that it wasn’t too bad despite the dire weather reports of the evening before. Jumping out of bed and dressing for a cold day I slipped out to the garage, with the family still asleep, and climbed in behind the wheel of my ’36 Buick with the excitement as though I was finally satisfying some guilty addiction. Inserting the key, flicking the switch on the steering column I paused momentarily as my finger hovered over the starter button, taking a moment in anticipation of the glorious noise that was to come. Pressing the starter I the mighty straight 8 roared into life with its earthy, almost primeval tones, so much for the sleeping family! Off I drove into the grey, rain spotted dawn. As my fuel gauge isn’t currently functioning (note to self that I have to get onto this repair) I have adopted the practise of re-fueling on the way out and on the way back. Pulling into the Caltex service station on the F3 freeway I had almost filled the tank when the station attendant called out over the Tannoy, “ Ah, customers, our EFTPOS is down we are only accepting cash”. Checking my wallet I could see any number of plastic cards but not a single cent . I approached the attendant and advised him of my predicament only to be dismissively waved to the ATM sitting at the other end of the shop. As I approached it card in hand I could see the notice “ATM unavailable” staring back at me. Returning to the attendant I asked him what I could do in the circumstances expecting some level of understanding and sympathy. His reply to the effect that “Well, you’ll have to sort out some way of paying for the petrol” caught me a little off guard. What to do?? Ah, my wife, curled up asleep in bed, surely she will lend me a sympathetic ear, and a little bit of cash besides! Pulling out the dusty mobile phone from the glove box I called Ursula and was greeted by a sleepy voice and a patient agreement that she would drive out to the service station and save me. After fixing up the bill with the morose service station attendant and quick kiss from Ursula I was on my way again. Driving through the damp and autumnal coloured streets of Turramurra I picked up my mate, Hugh, and set course for Rouse Hill. So much has changed out in the Castle Hill area over the years since I was last out that way in the late ‘70s in the back of Dad’s HQ Station Wagon, only the occasional bend in the road sparking a memory from my childhood. Finally we arrived at Rouse Hill Town Centre and with Virginia’s help made our way into the display area and were directed to an dry undercover spot, maybe there are benefits to turning up late! What a fabulous array of Buicks greeted us. I am in awe of the talents and efforts of the members in the restoration and maintenance of their vehicles. It was far to hard to decide on a favourite. 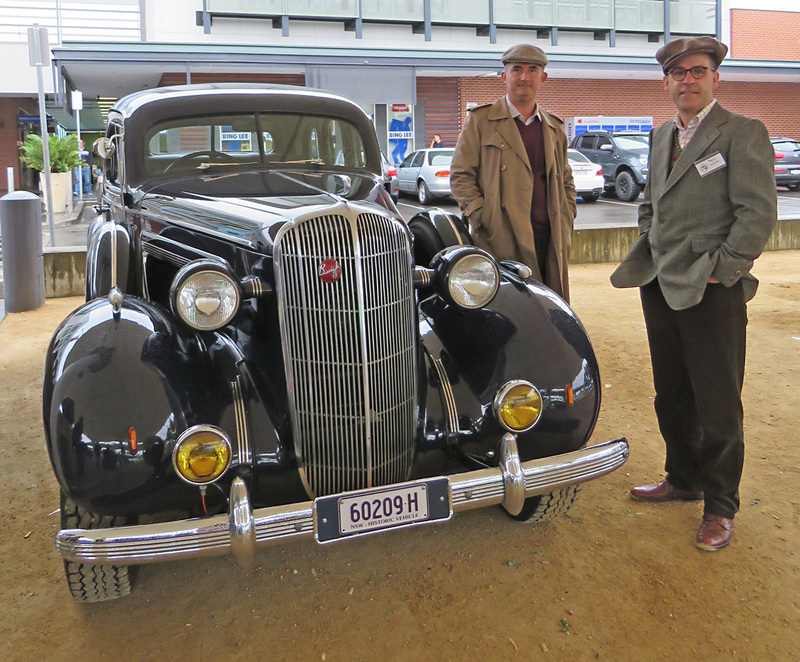 I had a great day chatting to members and listening to the odd Buick related stories. I think it was Ron Noonan who told me that he had once restored at 1938 Buick back in the late 1950’s and through the discussion I was able to figure out that I had taken the same vehicle for a test drive in February this year prior to settling on the purchase of my ’36 model. At 1.30pm we all gathered under cover amongst the Buicks awaiting the judges decisions. I admit that I was a little surprised and embarrassed in winning the prize for best ‘30s period vehicle, after all to date my efforts with my car have been limited to buying, polishing and putting petrol in it!! Anyway, the award has encouraged me to get stuck in and do some work on the “Beast” as my Buick has come to be known, with plans to restore and fit a number of model accurate accessories over the next 12 months. With the weather closing in and a long trip home we set off, the drive was uneventful other than experiencing some difficulty in seeking through heavy rain and some rain water falling on my socks through the cowl ventilator (another note to self to fit the seal as soon as possible). In all I had a great day and am grateful for the kind words and encouragement from club members. I am looking forward to attending the Nationals in Wollongong in August and spending more time behind the wheel.